TAMA Starclassic Walnut/Birch Snare Drum with Cedar Outer Ply 14 x 6.5 in. Earn up to 2,400 reward points. 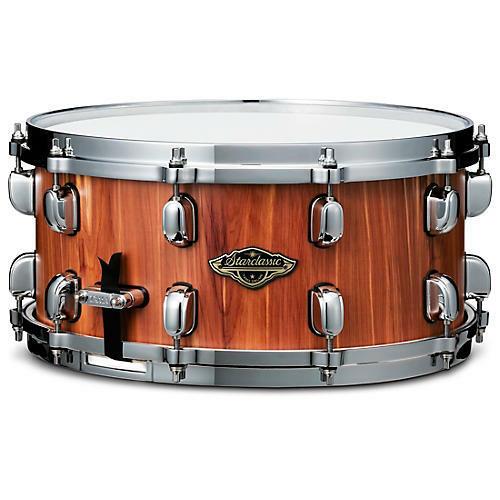 Beautifully crafted from unique tonewoods for an unmistakably TAMA sound. Tama’s Starclassic Walnut/Birch 14x6.5" snare drum is exclusive and loaded with professional features at a very consumer-friendly price point. The 6 mm hybrid shell consists of four inner plies of European Birch, layered with two plies of American Black Walnut, finished with an exterior ply of Eastern Red Cedar. The Walnut/Birch/Cedar shell delivers outstanding articulation and attack with deep tonal complexity. The outer ply of cedar adds a unique visual element uncommon at this price point. Highly polished chrome hardware adorns the shell, including die-cast hoops. The hoops project penetrating tones and thick rim clicks. The MCS70A throw off securely holds snare wires in place and is silky-smooth to operate. MS20RL14C Super Sensitive Hi-Carbon 20 strand snare wires provide clean snare articulation and sensitivity. An Evans G1 coated batter head completes the set of professional features. Built for the drummer looking to add a new sound and look in their arsenal, this Tama Walnut/Birch snare drum offers excellent features and performance at an excellent value.